For Spring Break 2016 we decided to take a road trip through Indiana, Illinois, and Missouri. 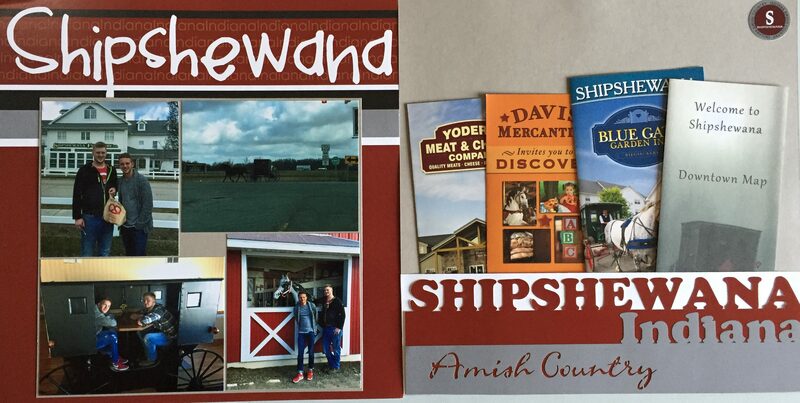 The next couple of spreads are from that trip, which we started by going to Shipshewana, Indiana, which is a beautiful Amish community. The two pages on this spread are made from pre-made background sheets that I bought in Shipshewana at a craft/candy store called The Scrapyard located in the Davis Mercantile. For the left hand page I used the full sheet and placed my pictures on a grey border to compliment the background colors. For the right hand side I used only the top of the pre-made paper to make the bottom folder to hold the brochures that we collected while we were in Shipshewana. I did this by running adhesive tape the full length of the bottom of the paper, and the sides of the folder, to create a strong seal that would hold the brochures in.